Golden bicolour brooch with freshwater pearl and diamant.Deze brooch is new. With pin and ball hook and a white freshwater pearl of 7.8 mm. The white gold piece is 1 cm wide and set with 15 diamonds of 0.11 crt. View more gold brooches? Click here. 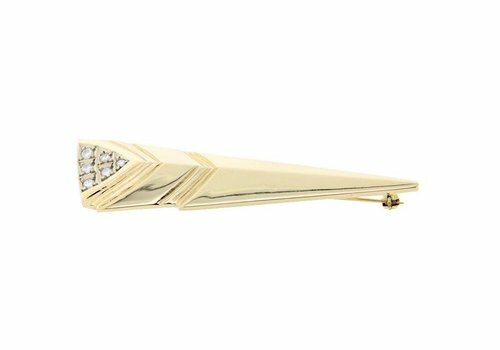 White gold vintage brooch with diamant.Beautiful brooch with pin and firm closure. With 7 diamonds bolshevik G-P1 / P2 total 0.52 crt. And 24 x 0.01 crt. old cut diamonds, spread across the whole. 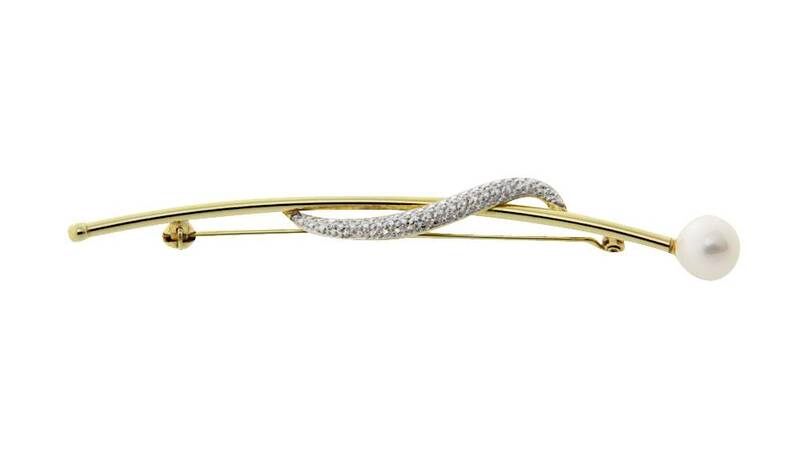 View more gold brooches? You can find them here. Golden brooch with cameo.This brooch has, in addition to a pin, a pendant eye, so that it can also be worn on a necklace. Nice smooth cabinet with a simple decorative edge. View more gold brooches? Click here. 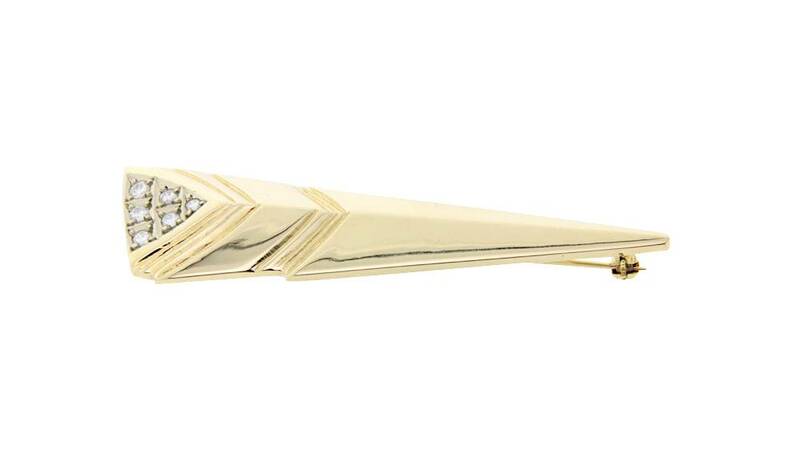 Beautiful ornate brooch set with 0.75 ct. Bolshevik cut diamonds.2 x 0.17ct. 1x 0.06ct. 2x 0.05ct. 2x 0.02ct. 2x 0.01ct. 2x 0.025ct. 2x 0.02ct. 2x 0.035ct. 2x 0.015ct. 14 crt yellow gold fantasy brooch with pearls. Dutch approved. Yellow gold brooch with cabochon cut amethyst 14 crt. Silver antique brooch fantasy 835. 14 crt yellow gold antique brooch with red coral. Dutch approved. Beautiful yellow with rose gold brooch. The brooch is beautifully worked. Golden Limoges brooch / hanger.Can be worn as a brooch as a pendant. Unique piece because there are no 2 Limoges images the same! We have even more in the second-hand collection, also as a ring. View more gold pendants here.